Space: It’s different! It’s not the usual style palette you come across in Indian markets. Look forward to dark grey floors and walls, complemented by light textured pottery, Balinese woodwork, and European prints and fabrics. One entire wall is a window looking onto green grass and foliage that makes space merge into nature. 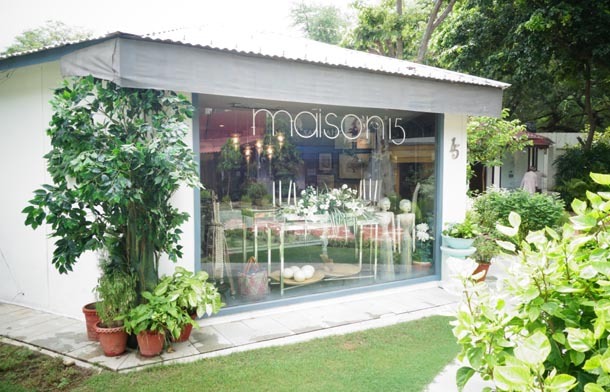 Maison 15 has brought select creations of pottery, wallpaper, art and objects from around the world and India to their graceful showroom in the Santushti complex. Tableware: Maison 15 has the sole rights for South African pottery brand WonkyWare. What we loved was the natural and earthy look done in a way that was chic and stylish. A semi-formal lunch or dinner would be the talk of the town with this kind of tableware. Wood and wickerwork: Handcrafted bowls, stools, wicker urns and more, from Kayu in Bali. Wallpaper: These were breathtaking, besides a lovely chair where you can sit and browse volumes of catalogs with a large selection of European prints, in a vast range of colors, in minimalist or bold patterns. They all look so good you could be there for a while. Matching fabrics are available to complement any wallpaper you chose. Bed linen: Fine cotton and subtle prints for duvets, cushions, and bedspreads, made by Maison 15’s. There’s also artwork, one-off unique decorative pieces, delightful candles, table linen and other great stuff.